As a second-term president, President Obama is a well-versed and professional public speaker on any number of topics. Sadly, there's one topic that he has gotten a lot of practice with lately — and it came up again over the weekend. On Sunday, Obama spoke about the Baton Rouge police shooting that killed three officers and injured another three, and he related it to the upcoming political nominating conventions in a way that's relevant to politicians and voters alike. On Sunday morning, at least six Baton Rouge police officers encountered what officials have called an "ambush" attack near Airline Highway, not far from the police department headquarters. 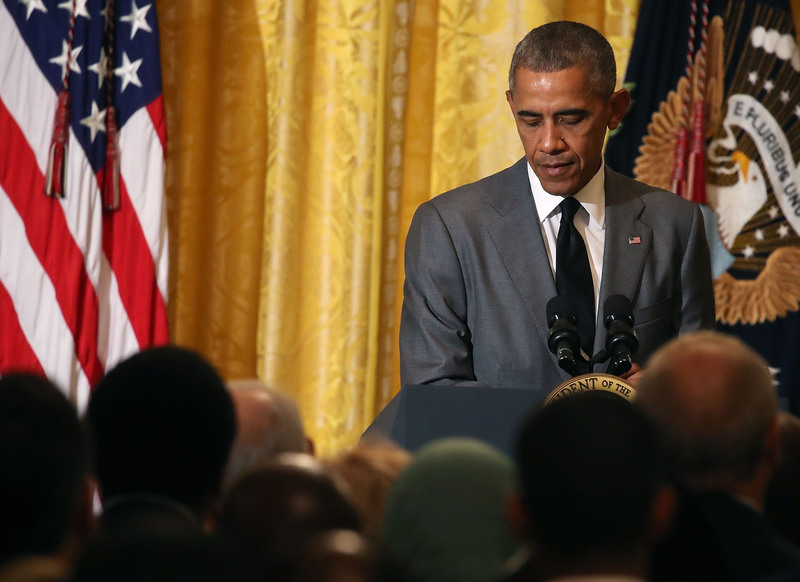 President Obama issued a statement earlier in the day condemning the violence. Then, at around 5 p.m. eastern, Obama spoke live from the White House for about 10 minutes. He didn't just reference the recent violence in Dallas and Baton Rouge when speaking about Sunday's tragic shooting. Mentioning the divisions in our country, he also issued important direction for the political leaders from both parties who will meet at their respective conventions later this month. Everyone, right now, focus on words and actions that can unite this country rather than divide it further. Continuing his point, Obama said, "We need to temper our words and open our hearts." He noted that the country would soon start focusing on the Republican and Democratic conventions, where rhetoric is often "overheated." The Republican National Convention will begin on Monday in Cleveland, Ohio, and the Democratic National Convention will take place the following week in Philadelphia, Pennsylvania. At the conventions, party leaders will officially name their candidates for this year's general election and they'll discuss the party's platform. Gun violence and how to respond to it has become a major talking point in the wake of incidents like the Pulse nightclub shooting in Orlando and the recent violence in Baton Rouge. Obama's guidance on Sunday clearly discouraged the inflammatory language that often characterizes presidential politics. Aside from his talk of the convention, Obama's speech on Sunday seemed all too normal. He's had to give these sorts of speeches almost constantly throughout his two terms as president. He even noted on Sunday that he was in Dallas just five days earlier to speak at a memorial service for the slain police officers in that city. "This has happened far too often," he said. Sunday's attack once again left Americans wondering what it will take to put an end to the violence that Obama said happens far too often. Figuring out how to make it happen less will soon become the job of the next president, and we're getting pretty close to deciding who that will be. It won't take long to find out if members of both parties heed Obama's advice, as the conventions are right around the corner.